The 2019 calendars of Saint John Paul II in five languages with the most beautiful official images by L' Osservatore Romano Photographic Service. 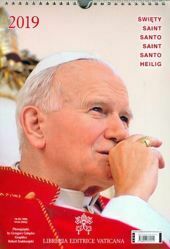 A wide range of wall calendars, desk and table calendars, magnetic refrigerator calendars, bookmarks, in different sizes and formats dedicated to the figure of Saint John Paul II. Made in Italy. 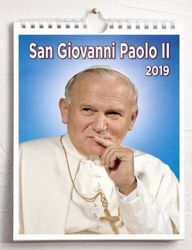 Calendario ufficiale 2019 della Libreria Editrice Vaticana dedicato al Santo Papa Giovanni Paolo II. Wandkalender 16 Monate Sept. 2018/2019. Text in Deutsch, Englisch, Französisch, Italienisch, Spanisch, Russisch. Spiralbindung.Farbfotos aus der Fotoagentur von Osservatore Romano.